Planning a powder room expansion can be complex — the art is in the details. 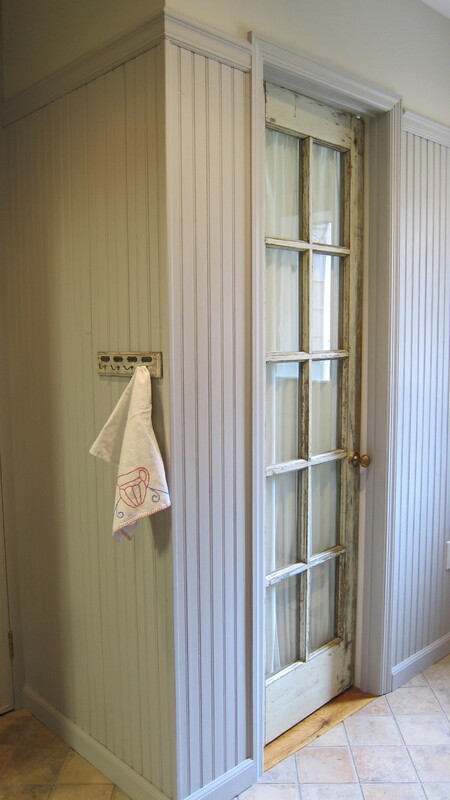 My powder room expansion project has been mentioned in several posts over the last few months as it’s been on my mind. The goal is to have a full bath with accessible shower on the first floor should we ever need to move our bedroom downstairs. A ground-floor bath also works for guests and would be a positive addition for future resale since it’s right near the back door. It involves adding 7 feet to our tiny — 5’8” x 5’8” — powder room by pushing out into the garage. This will be my third house renovation in the past 15 years so I know the drill pretty well by now. I’ve learned to take my time with the planning and shopping to avoid expensive changes later. I started with a graph paper sketch and approximate dimensions to include the new essentials — a no-barrier 4 foot by 6 foot shower plus a closet. Then I took a tape measure out to the garage to see what would be lost to a 7-foot extension there. That included the better part of the existing garage wall but left enough space for essentials and for the garage fridge. 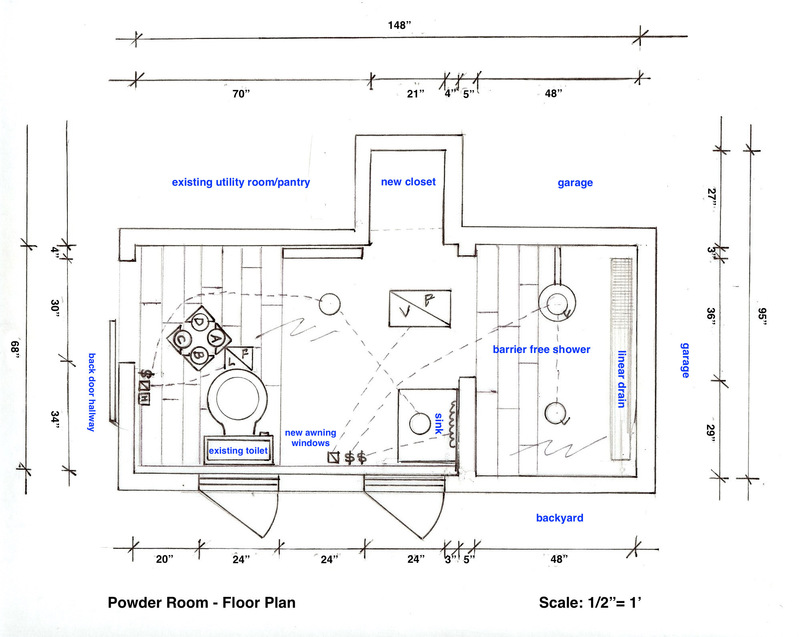 Then I drew a plan with exact measurements to scale using the original blueprint from our first renovation as a guide. Only then did I realize there wasn’t space for a big closet, that the bath needed a second window and I had to create a partition for the sink. It also became clear that I could preserve some of the bead board wainscot but that two walls should be completely paneled with bead board. Eventually, the parts clicked into place. 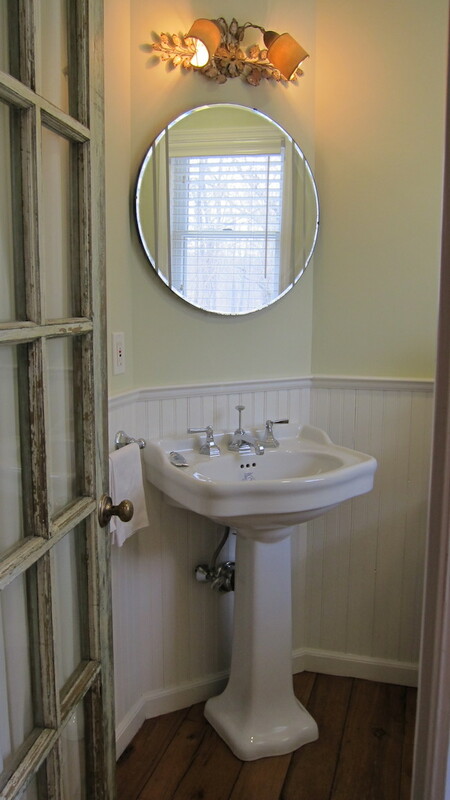 Our powder room has beadboard wainscot, a traditional pedestal sink and two of my favorite things in the house — a salvage door from the 1920s and a reclaimed barn-oak floor. Sadly, the floor will go. Reality: the new bath will be 6-feet wide and 12-feet long with this sightline from the door straight into the open end of the shower. Bowling alley. So the new floor needs to be tile that runs crosswise to visually widen the room and the entire bath needs the same “wet room” floor. I love tile and have always indulged my expensive taste. But this is a bath-on-a-budget. I quickly realized that porcelain wood-look would preserve the look of my well-loved floor and work for the shower. However, I need about 160 square feet of tile for the shower walls and ceiling and it must work well with the beadboard and the floor. 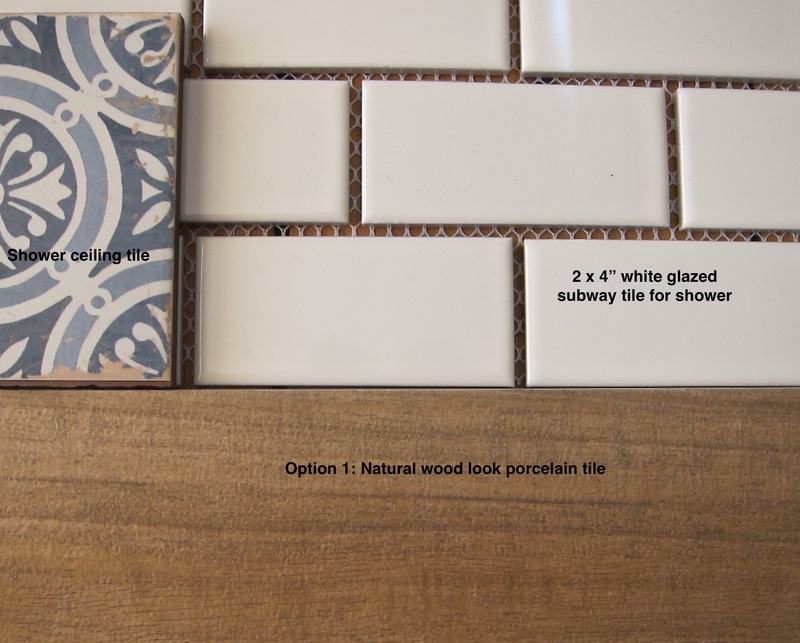 A lucky big-box-store find: 2 x 4-inch white subway tiles different only in color from the ones I had used for our New York apartment kitchen backsplash — and at a fraction of the cost! 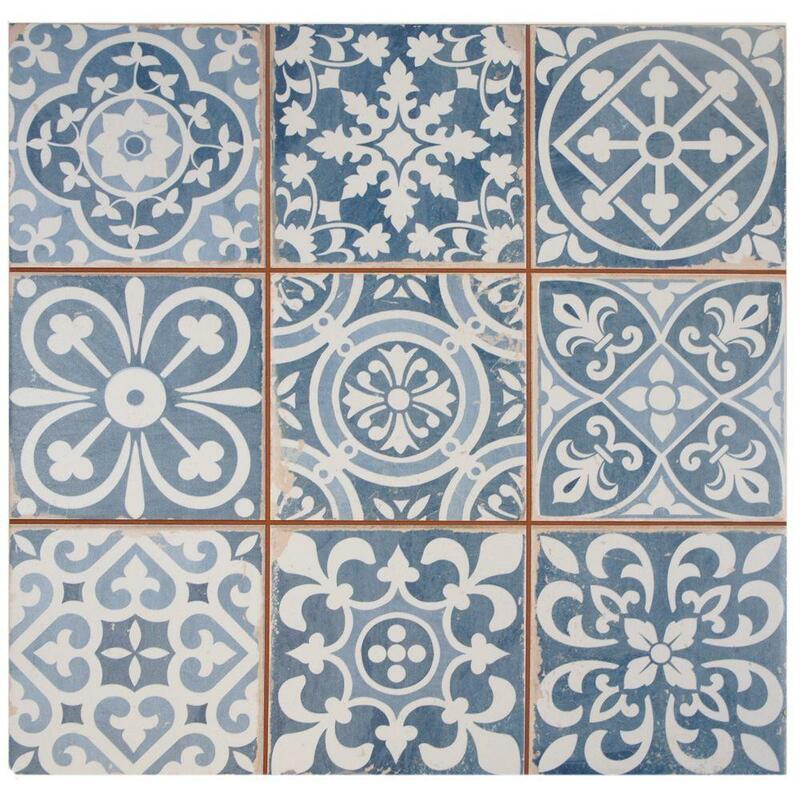 And while researching tile, I noticed a beautiful blue-and white Mediterranean pattern tile that would be too busy for the shower wall but an ideal solution for the ceiling! The sample was perfect. The plan includes the existing toilet and reusing the existing sink and Kallista faucet. 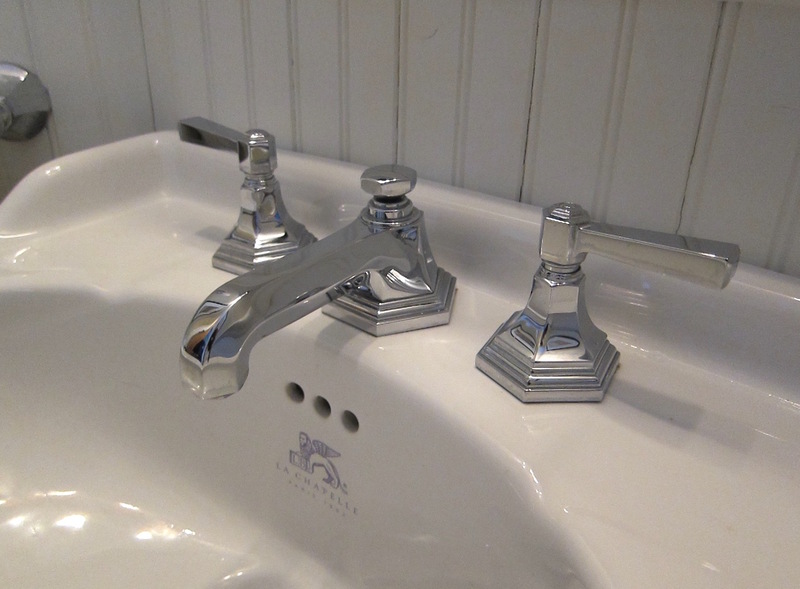 Kohler’s Pinstripe valve [below] is a close match to the faucet. An elegant shower system can be built around the valve, which turns the shower from hot to cold, using Kohler’s Hydrorail. 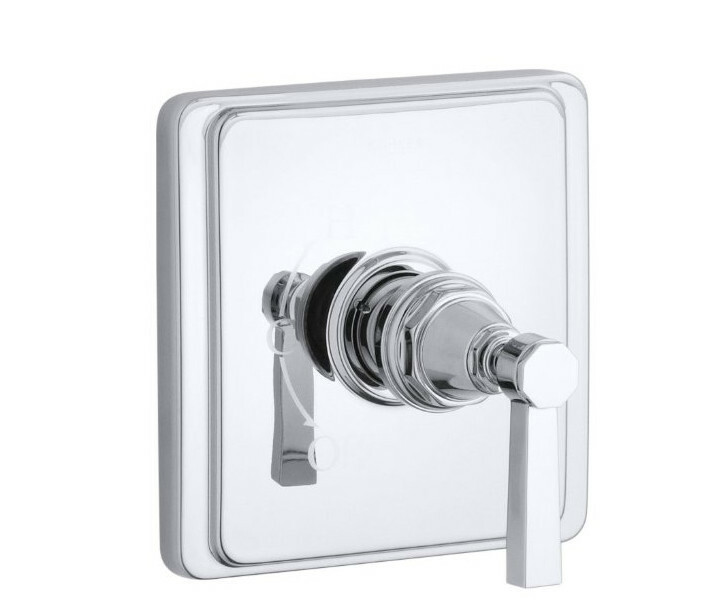 That would give me a choice of any Kohler hand shower since the Hydrorail includes an automatic diverter. With an open, accessible shower it makes sense to include a hand shower. If someone wants to bathe sitting down, no worries. When the children visit there’s flexibility, and it’s great to have a handshower when you come into the house after working outdoors and want to wash off quickly. Assembling custom shower components does add up, I learned. But at least three brands offer shower rail systems that include the handshower and a rain shower head. Hansgrohe and Grohe make the same type of shower system but with one control to turn the water on an off and a second to adjust the water temperature separately. The trade offs with those is not customizing the shower head or hand shower. Shower pipe systems are easy to install and designed for retrofitting older baths. But they make great sense and are budget-friendly to new construction once you find the basic components you need. Hansgrohe’s Raindance 240 Showerpipe System is more modern second option. 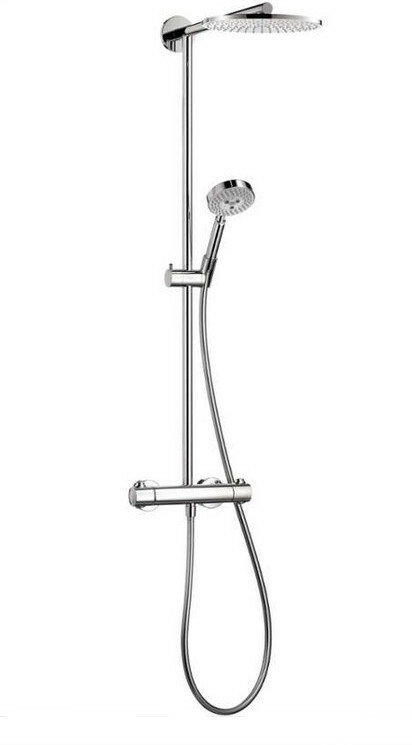 It has the same 10-inch diameter rain shower head I wanted. The hand shower isn’t too heavy and reviewers told me it doesn’t twist in your hand when the water is on. The bonus is the separate thermostatic control. Drilling down, it’s a question of style vs function. Once I had the plans drawn and details worked out, I was ready for a meeting with Gary, our friend and contractor who did the original house renovation. We went over all the details. 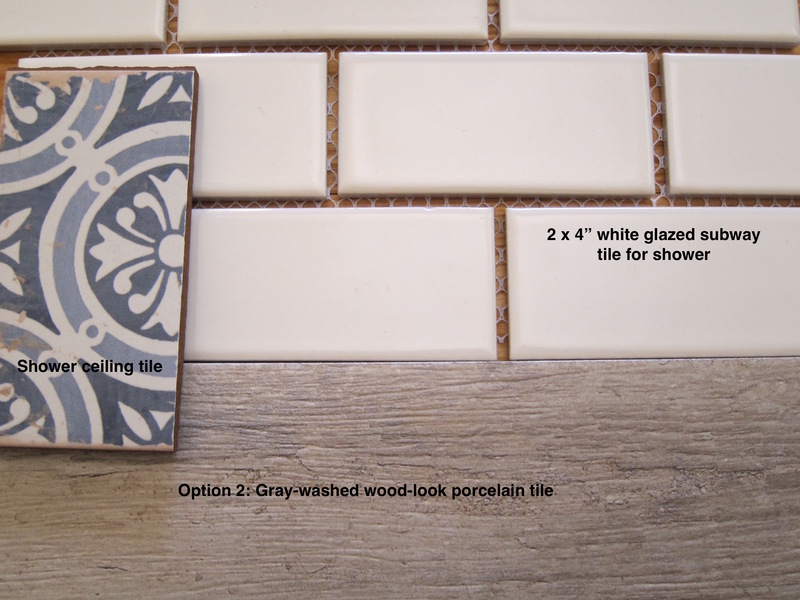 He especially favored option 2 for the floor and agreed that the pattern tile was great for the ceiling. He now has all the details for this powder room expansion and my fingers are crossed that the estimate will be in line with my thinking. There are many other aspects of the project — including doors, lighting, heating and ventilation to finalize. Even a simple bathroom renovation isn’t necessarily easy. Meanwhile, I’m almost as excited about the shower ceiling tile as being able to expand the bathroom at all! This is beautiful, Jane. I love it. Thanks Marsha. Just hoping the estimate isn’t off the hook LOL. That’s so sweet of you to say catmom. Waiting now, with fingers crossed, for the contractor’s estimate!